Image by fox2mike via FlickrJust as he did in Valencia, Felipe Massa has put his Ferrari on pole after a superb final lap. Early indications were that Alonso was going to be the man to beat but a problem with his car during the second qualifying session meant that he had to settle for 15th. Massa, who trails Hamilton by a point in the drivers' championship, beat Lewis by more than half a second although it's expected that he is running a lighter fuel strategy. 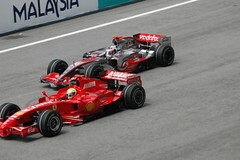 The drivers believe overtaking will be tough in the Singapore Grand Prix, which made qualifying all the more crucial. It's going to be a great race and if it rains that is going to be a decisive factor and also a cause for concern as with the race taking place at night it's going to make conditions very difficult. With the top two racers at the front of the grid and not much between them this is going to the wire.